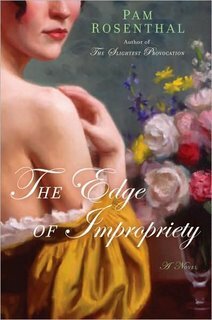 The amazing Pam Rosenthal will be here on Monday to answer all my daft questions about her latest release, The Edge of Impropriety. She’ll also appear on Lust Bites where we already know her alter ego Molly Weatherfield. Come and read Pam’s fascinating answers, comment and you might win a copy of the book! What a gorgeous cover! I think I remember Pam. Isn’t she a member of the Beaumonde? I’ll have to try to remember to stop by. I love Pam’s cover. It’s lovely. Yes Maria, that is Pam-she is a Beau-monder! And the cover is beautiful! I’m definitely a beaumonder. Wonderful group — in fact, I’m beaumondePAN liaison, and a little behind in inviting new published members to the loop (a few little things like a new book and a history-making election got in the way). But if anybody thinks I’ve forgotten to send her an invite, please do write to me. And thanks for the kind words about my awesome new cover, Maria and Shelley. Beautiful cover, beautiful words. Thanks, Kate and Molly, for taking time to do the interview–I enjoyed reading it. Molly, I love your work! Hey Barrie, great to see you here.